Usually I end up with some leftovers after fiber has been weighed and bagged and tagged. These are perfect for spinning up as sample skeins, or for playing around with different techniques. Last month, before crazy vacation and moving plans hit in full force, I did just that with a bunch of scraps of Oregon Green and YFP Dorset Horn (currently available in the shop here). I took the scraps from these two dyelots and spun up five different 2-ply sample skeins. The first two are the obvious: each colorway plied with itself. Then I did a skein of 2-ply using one single from each colorway. That was all well and good, and relatively straightforward. But then I decided to try another spinning technique to try blending the colors a bit more. I took a piece of each color of top and held them together while I spun, so that the single incorporated a bit of yellow and a bit of green. Sometimes there was more of one color then the other, but I tried to keep it as evenly distributed between green and yellow as I could. You can see that, while it's still possible to distinguish yellow and green, they are much more blended together. I did all these samples in a couple of days, and then put the experiment away for a bit. As any scientist will tell you, sometimes things need to sit and ferment for a while before you conclude anything. In the meantime, I started thinking about Tour de Fleece, and my goal of spinning up some yarn from raw fleece. This, of course, requires some kind of fiber prep, and my current tools include a pair of hand cards. It occurred to me that a nice addition to the first set of sample skeins would be some color blending by carding. And voila! So what does this all mean from a knitting perspective? 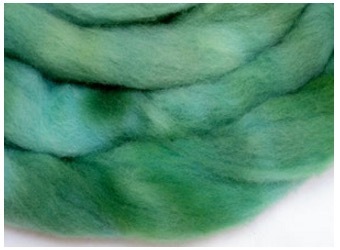 And why would you bother carding or blending during the spinning if you've got two different colors of fiber? I knit up a simple swatch with all of the samples, in this order: OG/OG 2-ply, OG/YFP marled 2-ply, OG/YFP blended 2-ply (colors held together during spinning), OG/YFP carded 2-ply and finally, the YFP/YFP 2-ply. It's a bit hard to see the transitions between the middle three samples in this picture, so let's add some markers. 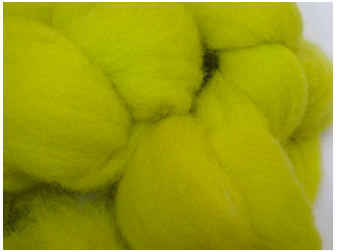 The change from OG/OG to OG/YFP is easy to see - as soon as you add any yellow at all, you get a yarn that, from a distance, reads as a strong yellow-green. If you look at it a bit closer, you can see the dramatic marl created by yellow and green singles lying next to each other. However, the difference between the OG/YFP 2-ply yarn, the OG/YFP blended yarn (where the colors were held together during spinning of the singles), and the carded OG/YFP yarn is harder to distinguish (black line indicates the point where the yarns switched). To my eye, the biggest difference between the blended and carded yarns is the uniformity of the carded color - there is much less variation since the fibers were thoroughly blended before spinning. The blended-while-spun yarn has much more variation, which may or may not be what you're looking for. Finally, the comparison between the carded OG/YFP yarn and the YFP/YFP 2-ply. No black line needed to indicate change in yarn, right? So what does this mean for you as a spinner? Well, I think that depends...what a helpful answer! But really, it does depend on what your ultimate goal is. If you have a fiber that is dyed in a colorway with a lot of contrast, you can spin it to preserve and enhance those contrasts. Maybe you want very stripey socks, in which case you would chain-ply your singles. Or you think the colors would look great in colorwork mittens, in which case you can split the dyed top into its component colors and spin them seperately - just because it came to you as one piece of top doesn't mean you can't split up the colors just as you like! On the other hand, maybe you want to blend the colors a little bit, in which case a 2-ply might work well. Depending on how you split the top, you can end up with sections of marled yarn, maybe some sections where the colors line up and enhance each other. A 3-ply will blend the colors even more. Or maybe you really want to mix things up a lot, in which case you could spin two different colors together, creating a marled single that will further blend the colors with plying. Or maybe you want to create a yarn that is a totally different color then the top you started off with, in which case you could whip out the hand cards or drum carder - a word of warning on carding, however: if you are trying to blend colors that lie across from each other on the color wheel, you may end up with a whopping pile of brown yarn! I hope this has been and interesting and useful post. Have you done your own color experiments? What effect do you like best? What's been an absolute disaster? Let me know in the comments, and we can talk about how to get the color effects you want, depending on your starting point. I hope everyone is enjoying the (late-arriving but finally here) British summer, and happy spinning!